This class is designed for those brand new to yoga, or for experienced practitioners who want to deepen their practice by reconnecting to “beginner’s mind”, alignment essentials, and foundational breath work. 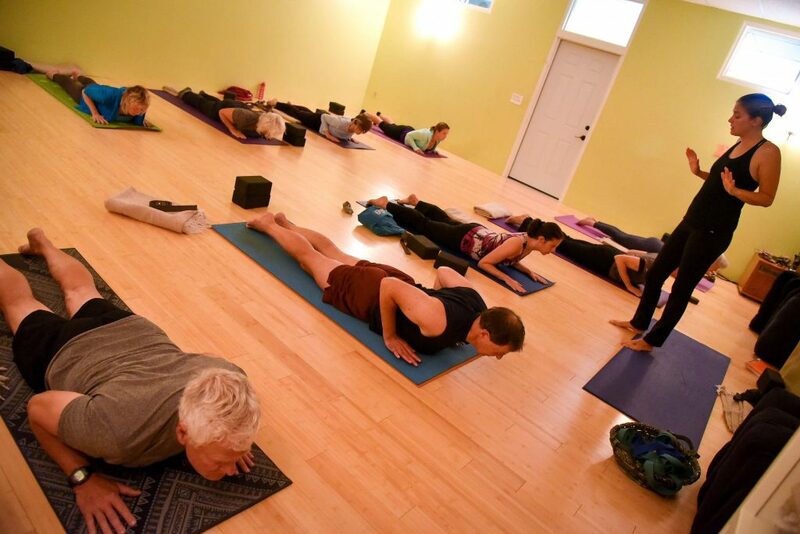 We will introduce and practice foundation poses and pranayama (breathing practices), explore pathways to progress through “start where you are” modifications and props, and connect elements and breath through simple vinyasa. Slow, deep stretching combined with active, flowing postures. A great deep stretch class for beginners, athletes and anyone wanting to give their connective tissues a workout. Postures are held in a reclined or seated position for 3-5 minutes. The deep stretches done in Yin promote flexibility, mobility, healing and breath awareness. Release tension in this soothing, calming class incorporating basic postures with breath work. A flowing class that begins with gentle opening stretches, and moves into more vigorous poses activating all muscle groups, and ends with a restorative phase. In this class you will move through a gentle flow with primarily standing poses. There will be a special focus on incorporating poses that help with balance and strengthening accessory muscles for balance. This class is appropriate for all levels. Spending some time in each class to focus on a short breathing exercise and practicing yoga with intention and awareness, focusing on alignment in each asana. Take it slow with this downtempo, but challenging approach to vinyasa yoga. During this practice, we will link movement and breath to reveal body awareness, inner strength, and mindful opening. We will break down fundamentals of safe asana to better understand our minds and bodies on an intellectual and spiritual level. Come enjoy this delicious synthesis of movement, breath, and energy. An active practice linking breath with movement. The element of heat improves circulation and metabolism and allows muscles to open to their full range of motion. Room is gently heated to about 80-85 degrees.